‘Tis the season of comfort foods! While my husband and I were out to dinner on Saturday, we made a quick meal plan for the week. He suggested chicken pot pie – which we both haven’t had in ages. I immediately recalled my mom’s chicken pot pie and how much I enjoyed it growing up. When I called her over the weekend to get the recipe, she mentioned how easy it was – and she was right! Spray a pie plate with Pam. Unroll & lay one of the pie crusts on the plate. 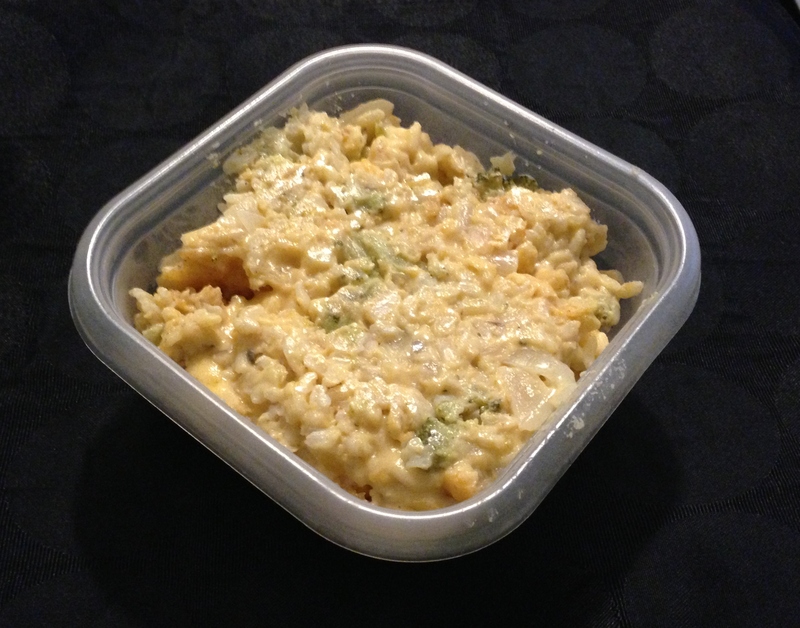 In a bowl, combine chicken, soup, veggies, seasonings, and cheddar cheese. Pour onto pie crust. 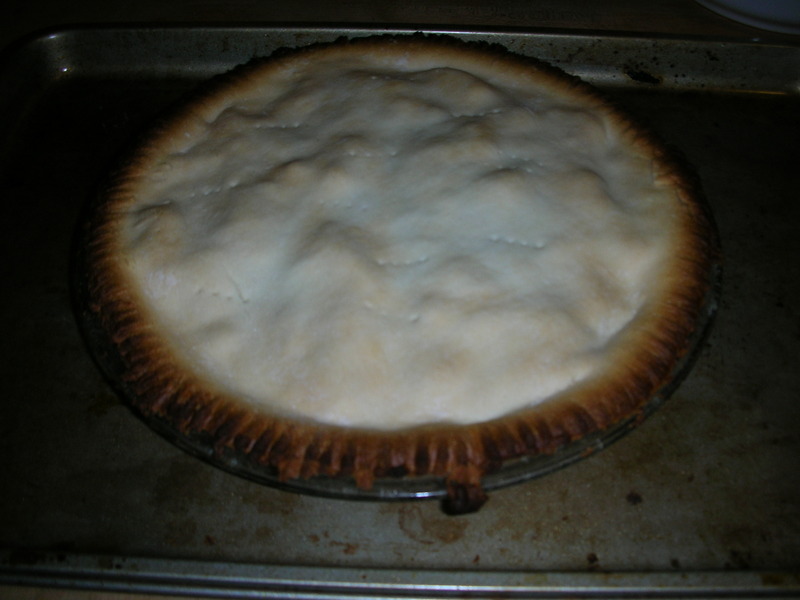 Top with the remaining pie crust. Poke a few holes in the top of the crust to vent. Seal the edges with your fingers or a fork. Bake at 425* for 35-40 minutes. 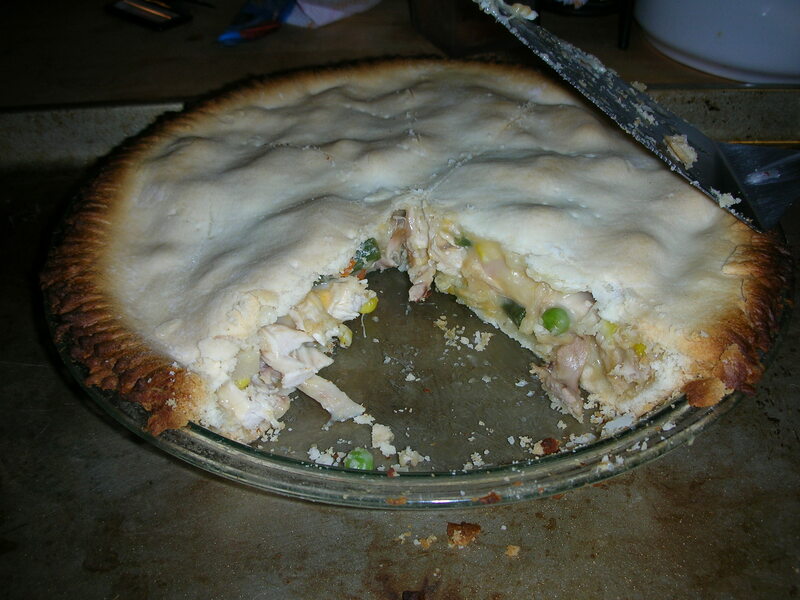 I’ll admit – it’s not the prettiest chicken pot pie ever, but it’s very tasty! A good, comforting, and quick weeknight meal! The only eggplant dish that most people (myself included) learn/try to make is eggplant parmesan. It’s not fast, but it’s easy and a crowd-pleaser. If you can get past the name and the texture – eggplants have little seeds – you can find that it’s actually a pretty tasty vegetable, especially smothered in tomato sauce and cheese. We got a few eggplant in our CSA this past week and I wanted to cook them up, rather than try to freeze them – AND, I wanted to make something other than eggplant parmesan. Furthermore, with the change in the weather, I was craving something oven-baked, that would pair well with the breaded chicken I was making as the main dish. I found this recipe on an old-favorite of mine, Allrecipes.com*. I tell ya, if you’ve never tried this website before, do so! It’s a great hub of tried & true recipes (and some terrible ones, to be honest) that people all over the world post, cook, and rate. It’s a great go-to when you have a vegetable and/or ingredients and you’re just not sure how to pair them together. That being said…here’s a great side dish & casserole that helps you use that eggplant you receive in your CSA, when eggplant parm just won’t do! Place eggplant in a medium microwave-safe dish. Cook for 3 minutes, stir, and cook for an additional 2 minutes. Transfer to a square baking dish. Mix in tomatoes, stuffing, garlic, onion, egg, and 1/2 cup cheese. Season with Italian herbs, salt & pepper. Bake for 15 minutes in the oven. Top with remaining cheese, and cook for an additional 15 minutes. You will notice right away that there isn’t any tomatoes in my casserole. This was an addition that should have happened, but realized after the fact. While the original recipe does leave this out, the original recipe also turns out decently dry; I read several reviews on the website that all stated that this addition was a good idea. 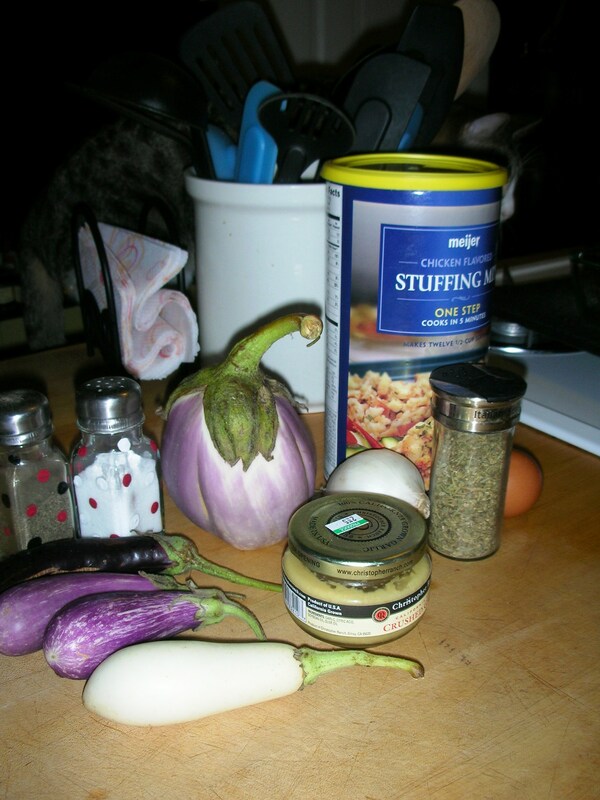 If you’re weary about making eggplant, or are in need of a new idea for it…try this recipe! You won’t be disappointed. 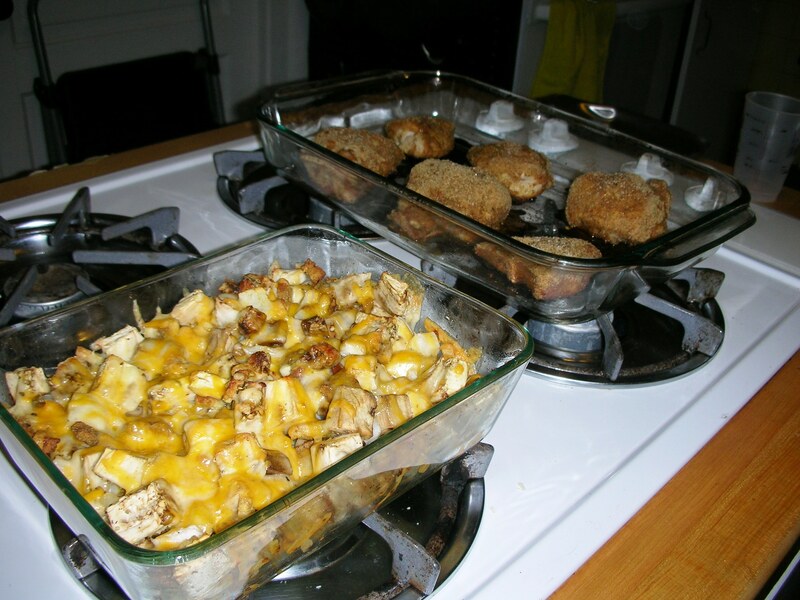 Cheesy eggplant casserole, and breaded chicken. Great dinner on a rainy night! 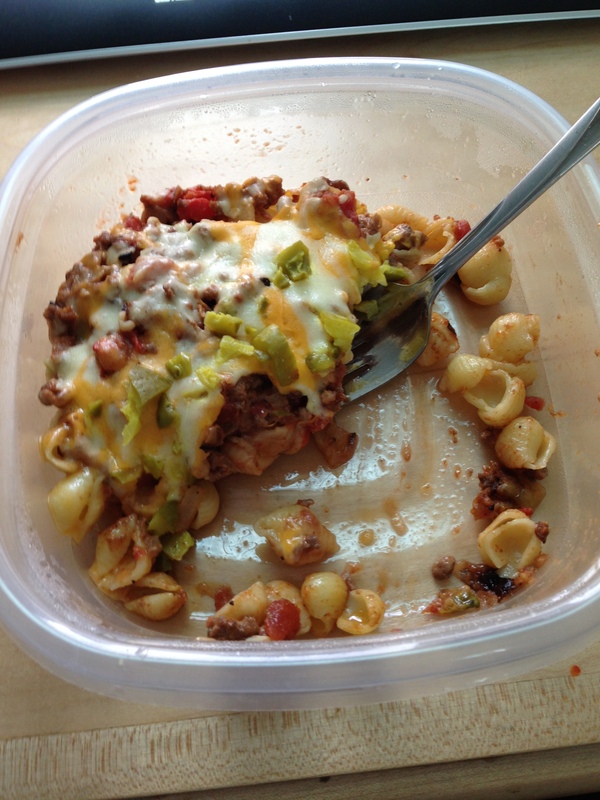 * NOTE: I was not asked nor paid to talk about Allrecipes.com, nor mention the Sargento brand. These opinions are solely my own and for the enjoyment of my readers.